Extracting text messages from iPhone? Is there a way to extract iPhone text messages into a text file? Someone in my family, one of my grandsons, in fact, is in hot water over text messages he sent and received, and a file showing who texted what wuld be very useful to his family right now. SQLite will allow you to dump the results into a text file and print it off. you can go through the message list on the phone and take a screenshot as you go down the messages by hitting the home and power buttons together. The images for that message sequence would go into the photo album and you can send those to the computer to merge in say Photoshop. I need some help. I have installed the SQLite Database Browser however when i try to open a mddata file it gives me an error "File is not an SQLite 3 Database"
Can someone explain to me how to view or open the mddata files. I am trying to recover text messages but can not seem to view any of the files. I believe that i am trying to open the correct files from the MobileSync/Backup folders. They aren't all sqlite databases, that's why you have to use the fgrep terminal command. It looks for the database table inside each of the backup files. It should give you one or two files that have the word msg_group inside. You can then copy those files out to work on them. The path may be wrong in the last post or they may have changed the location for people who can't find it. My current one is in /Users/<username>/Library/Application Support/MobileSync/Backup. Start with the one with the most entries and open it in the database browser. Hopefully I can revive this post for some help here. 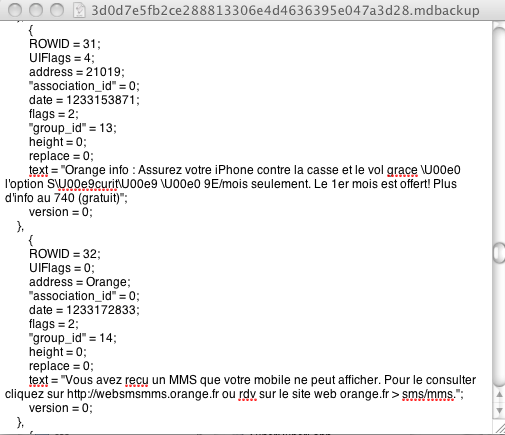 I have been able to find the UUID file that contains the sms messages and open it in a SQLite browser called Base. SQLite Database browser would not open the file saying that it was not a database or was encrypted. I have recovered 2357 SMS messages from the file, but when I open the UUID file in Text Edit I am able to see messages that are not showing in Base. Any ideas why this is happening and what to do to recover all messages? SQL browsers often only show limited results at a time e.g 1,000 rows. Check if you have multiple pages of results that you can flip through. Thanks for the message Marvin. Base does only show 100 lines at a time, but I have looked through the entire list of 2395. Could it be that the data is corrupted somehow or that it does not show deleted messages? I can find a message that is right next to the hidden one in Text Edit, but it won't show in the browser. Could it be that the data is corrupted somehow or that it does not show deleted messages? I can find a message that is right next to the hidden one in Text Edit, but it won't show in the browser. If you check in Textedit what the id of the message is and order the database table by id ascending, you should be able to see it. The SQL browser's default listing won't always list the results in the same order as the file. If the unique row id is missing in the SQL broswer make sure it's supposed to be in the table you are browsing. If you are using an SQL query, check you aren't using a query that excludes it from the results. Thanks for your continued interest and ideas. This one is a stumper for sure. The data besides the textual data is all scrambled ( SQL binary data I'm guessing ). Here is an example. The first group shows up in the Base SQLite browser, the following 2 do not. I can't see any pattern that would indicate why. Yeah, there's no reason it shouldn't load in. You had some phone numbers pasted into your text so I removed them for you. This sql file can then be imported into any standard database app like Sequel Pro or Navicat although you might have to correct some syntax errors. That will dump your messages as a csv file. You can order the messages by date or by group or whatever column and you can choose to only export certain columns of data. Thanks again Marvin. Feel like I am soooo close on this. I have the file converted to SQL and have verified the 2395 messages using grep. Just having an error converting to csv files. I have tried the SQL in lower case as well. Any further clues? Then do the CSV steps once you have opened that file. I was able to get the SQL file, however just like the SQLite file it does not include all of the messages, including the specific ones needed here. I'm stuck after spending many hours trying to get this data into a format that is usable for litigation with no results. Does anyone know of a good iPhone forensics firm that may be able to get past the issue here? You can encrypt the file using Disk Utility (put the file in a folder, then use /Applications/Utilities/Disk Utility, then file > disk image from folder, choose folder, then options compressed/encryption AES 128) and then just PM me the password and the link. If I can get the messages to show, I will either send back the list or instructions on how to extract them. It's possible that the data could be corrupted or yes that it won't show deleted ones. I suggest you look to see if there are multiple backups and run the same thing on each. you might find some more bits of what you are looking for. I'm done with this one. I restored the backup onto my iPhone and was able to retrieve the same exact stuff, iMessages and SMS from the backup. I have found that deleted messages are not easily recoverable. I know there are forensics out there that can do it, but I am not that invested in this. My client unfortunately deleted the messages he wants to use in court. Thanks everyone for all of your suggestions and help. I wonder why he didn't just show the court the phone? the actual text message in the message history would be enough to tide them over right? maybe a screenshot could have showed a print of it for the evidence bin. He deleted the messages in a fit of anger... I was able to produce a text file that had the messages embedded, albeit in a very garbled way with no date/timestamp or clear indication of what number/iMessage account sent the message. How do you do this with MS-DOS?